The Knowledge issue of la colle the collage zine will come out sometime in 2011. More details to come. Let's just say I learned a lot in 2010. A Collage Night will be held. So far I've received 2 collages (hooray for you two) but we need more for a full issue! Format: the zine is photocopied in black and white on legal paper. While there is room for one center-fold (or I guess two if you think about the cover) 8 ½ x 14 other collages will be reproduced on 8 ½ x 7 spaces.Please email You your collage (a hi-res, 300 dpi image) to me. the next issue of la colle the collage zine will come out sometime this winter- right now it looks like february. i plan to hold a collage night sometime towards the end of january so if you're in the brooklyn area you can always wait for that night to make your collage. if not feel free to email or mail me your contribution! the theme this time around is KNOWLEDGE. the next issue (#7) of la colle, the collage zine, will come out sometime this winter. in order for it to exist it needs your collages and other contributions! -the fact or condition of knowing something with familiarity gained through experience or association (2) : acquaintance with or understanding of a science, art, or technique b (1) : the fact or condition of being aware of something (2) : the range of one's information or understanding c : the circumstance or condition of apprehending truth or fact through reasoning : cognition d : the fact or condition of having information or of being learned a person of unusual knowledge. you can of course take whatever position you want on this theme. albert einstein said, "Imagination is more important than knowledge. For while knowledge defines all we currently know and understand, imagination points to all we might yet discover and create." format: the zine is photocopied in black and white on legal paper. While there is room for one center-fold (or I guess two if you think about the cover) 8 ½ x 14 other collages will be reproduced on 8 ½ x 7 spaces. You can email it to my yahoo adddress, juliejeanus (a hi-res, 300 dpi image). i hope to hold a collage night sometime in the near future too, so stay tuned for that. i look forward to seeing what you will contribute! Issue 6- Clothing and/or Fashion now available! Clothing and/or fashion is the theme for this issue because it was a subject I was reading about and thinking about myself....Hopefully this issue offers some new perspectives on clothing and/or fashion and offers new options for you to try on. Here are some of the links and resources in issue 6! The pre-eminent American poet John Ashbery makes his solo debut as professional artist at 81, with a modest but polished exhibition of two dozen small collages. Address: 807 East Main Street, Durham (Main Street through downtown, turn left on Morning Glory on the left, soon after JC's Kitchen on the right). Collage Night encourages people to take up scissors and glue and create. Source materials including paper, scissors, and glue will be provided, but participants are encouraged to bring additional materials. Julie will be collecting collages for her zine's 6th issue, with a clothing + fashion theme. Anyone who submits a collage for this issue will receive a free copy. Stop by Studio 131 and make a collage! Call for Collages- Clothing is the theme for Issue 6! Clothing is something we encounter everyday. It can allow us to make statements (personal or even political), sometimes we us it to differentiate ourselves from others, while other times it aligns us and allows for group identification. The way clothes are made and who makes them, how and with what materials are also related issues that this theme allows one to explore. Maybe one of your parents sewed clothes you have worn or maybe you sew your own. Anything in this broad-ranging theme of clothing allows you to explore these and even other issues and ideas. To parallel my own thoughts and investigations into clothing the next (the 6th!) issue of la colle, the collage zine, will be devoted to clothing. This year I am trying to sew any new clothes or purchase them from companies with fair trade policies after reading about the GAP’s use of slave labor to make skirts this past fall. Maybe you’ll just make a collage, but maybe this theme will bring to your attention larger themes related to clothing. When preparing your submission keep in mind that the zine is photocopied in black and white on legal paper. While there is room for one center-fold (or I guess two if you think about the cover) 8 ½ x 14 other collages will be reproduced on 8 ½ x 7 spaces.This issue will come out sometime this winter, so submit you clothing collages by December 1, 2008. You can send your collage (a hi-res, 300 dpi image) to my yahoo address juliejeanus or if you prefer to mail it, e-mail me and I’ll send you my mailing address. Also feel free to pass along any clothing-related songs, books, exhibitions, websites or exhibition reviews you’ve written along. 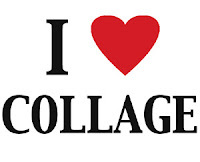 If you submit a collage you will receive a free issue of la colle in exchange for your contribution. la colle issue #5- MAPS- now out! The 5th issue of la colle is now out! a list of maps in songs. Current and upcoming collage and map exhibitions (also listed below). If you submitted a map collage (THANK YOU! ), your complimentary issue will be mailed soon. If you would like to purchase this new and exciting issue it will be posted shortly on http://www.juliejean.etsy.com/ and will also be available at Quimby's in Chicago (http://www.quimbys.com/). Only with your support and/or collages will la colle continue to exist. The next issue of la colle will be assembled sometime in Winter 2008 or early 2009. The theme will be Clothing (which could also, but does not have to, include fashion). More details to follow. Includes Maya Lin’s Altered Atlas, 2007, made from a recycled atlas and a photomontage by Ken Fandell. I am an independent scholar and curator. I have been researching and writing about the artist Ray Johnson since 2006. I am also interested in photography, Black Mountain College, and artists associated with Fluxus. My writing has appeared in Black Mountain College Studies, the Independent Weekly, Raw Vision, Art Lies, and ...might be good. I have a M.A. in Art History from the University of Massachusetts Amherst and was a Critical Studies Fellow in the Core Program, Museum of Fine Arts Houston in 2010-2011.